Founded as a monastery in the 7th century, Winchester Cathedral became known as the 'Old Minster' in the 10th century, following the establishment of a 'New Minster'. With its increasing prestige, it received additional lands throughout the middle ages. 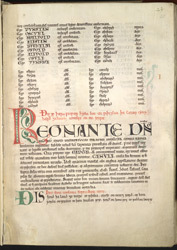 The 'Codex Wintoniensis,' probably compiled under Henry of Blois, bishop of Winchester (1129-1171), is a collection of the Old Minster's Anglo-Saxon charters (a 'cartulary'), considered the best from an early medieval British religious house. The charters date from the reign of Ceadwalla of Wessex, AD 688, up to Edward the Confessor, AD 1046, plus a few of the later 11th and 12th centuries. Henry probably had it made to establish the Old Minster's property rights when King Stephen, his brother, was pressing for support from the Church. The page presents, at top and bottom, the beginning and end of a charter of King Edgar (959-975) to Winchester Cathedral concerning land at Taunton which the king granted in exchange for land at Crowcombe, Compton and Barnwell, Somerset, and Stoke near Shalbourn, Wiltshire. Sandwiched in the middle, another charter of Edgar grants land at Withiel Florey, Somerset, to Cenwulf, 'his faithful man.' Other copies of it survive, from the 10th and 17th centuries. The charters are written in Old English and Latin.